Often we compartmentalise emotions. We often label particular emotion as masculine or feminine when they are just human. Anger over assertion and weakness over sensitivity can have men and women feeling boxed in with how they express themselves. These hyper-feminine and hyper-masculine responses can be toxic if unbroken, and Script Writer and director TD.Moyo’s theatre production Feels gave us all the feels as part of her contribution to this years Evolution Festival 2019. As part of a 2-day residency at The Lyric Hammersmith between 11th - 13th March 2019, five black men tell the story of chasing the rainbow and searching for a pot of money. Starring actors Chiedu Agborh, Deenie Davies, Bola Okun, Martin O-Whyte and Tolu Kingba, the production explores their transatlantic, multi-generational, don't care if you're a boy or girl, in your face, catch this vibe, spot the lie, Black is beautiful, never ending type of feeling. The five male actors display a concrete sense of identity across the myriad of characters they reflected; from NYC prison inmates, boys from the ends and Caribbean women, each character transported the audience through a unique selection of feelings. Black women are infamous for supporting all those around them, namely black men. As a black woman, we asked TD.Moyo what some of the eye-opening experiences of the rehearsal and development phase was, she shares that, “realising how fluid feelings are has changed me, not only as a director but my entire perception of humanity has been altered. Men feel, constantly. As soon as I realised that, my rehearsals went from being microscopic meetings into the Black male psyche into a shared adventure of feelings”. The stage was accessorised with what initially resembled scaffolding, and the actors were abstractly positioned on and around it, dressed in what looked like hospital patient’s overalls. The set interchanged as the feelings unfolded and despite being female, there was a personal reference point in each storyline for me. 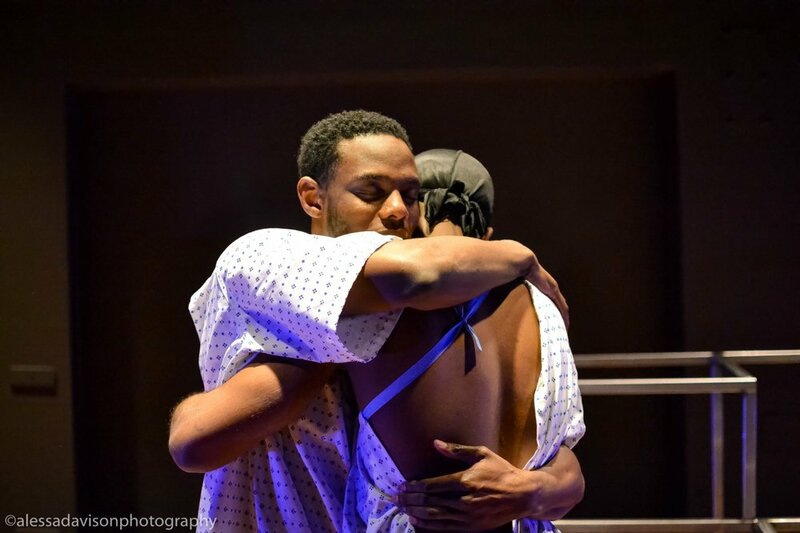 TD.Moyo speaks to that and explains, “In all honesty, FEELS became a play about black men and a black woman's feelings - both can exist in paradox and equality, all our feelings and intersections can and should exist (on stage) together”. From emotionally charged arguments, heated egotistical confrontations, to more intimate recollections of their romantic history, the cast seamlessly journeys through.. life. They had the audience gripped and reactive from scene to scene, commanding laughs, cheers and silence through their feelings. From a directorial perspective, TD.Moyo shares that her experience was a rollercoaster “..it has low moments. As a director everyone trusts you to know what to do (especially with devised work) and sometimes I just don't and that is okay. It is okay for me to not know, I will figure it out eventually”. This is a very important and necessary message for us all, having all the answers takes away from the mystery and adventure of any one venture, and feeling fine about that is where the magic is birthed. The show excellently drove home the message - “We are all often subject to our feelings and though the quantity of our feelings may differ the substance is the same”.